We invite you to say a prayer below to our most powerful patron, St. Jude. 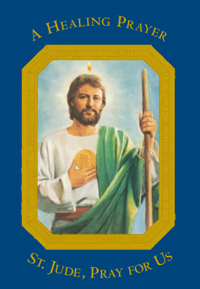 You can also share the hope of St. Jude by forwarding this opportunity for prayer to those you know who are in need of St. Jude's intercession, and let St. Jude intercede in your life by sending your prayers and petitions to the altar of St. Jude at the National Shrine of St. Jude. 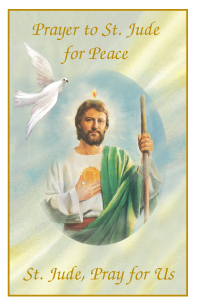 These St. Jude prayers appeal to the powerful saint for healing and hope for impossible or especially difficult cases. Together, let us share the hope of St. Jude with a world in need. Most holy Apostle, St. Jude, faithful servant and friend of Jesus, the Church honors and invokes you universally as the patron of hope. Come to my assistance in this great need that I may receive the consolation and help of heaven as I work with my challenges, particularly (here make your request). I praise God with you and all the saints forever. 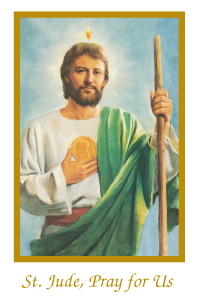 I promise, blessed St. Jude, to be ever mindful of this great favor, to always honor you as my special and powerful patron, and to gratefully encourage devotion to you. You give me hope, St. Jude, in the face of loss and sorrow. 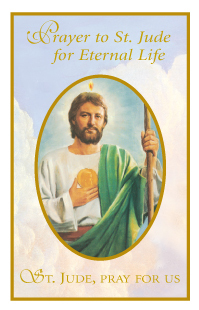 I pray that you will guide all souls to the light of Christ. May the hope that you offer be a source of comfort to all those who grieve. For in that hope and through our faith, we experience God’s tender mercy, and trust His promise of eternal life. 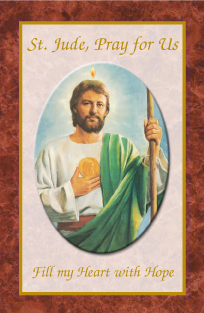 Stay by my side, St. Jude, so that I may always rely on your care for me. Amen. 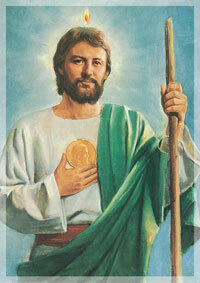 Most holy Apostle, St. Jude, I place myself in your care. Pray for me; help me remember that I am not alone in my struggles. Please join me in asking God to send me hope in my sorrow, courage in my fear, and healing in the midst of my challenges. Please ask our loving God to fill me with the grace to accept whatever my life holds and to strengthen my faith in His healing power. Thank you, St. Jude, for the promise of hope you hold to all who believe, and inspire me to give this gift of hope to others. God the Father, give me hope. Help me to know that your hope is alive in me as I offer kindness, forgiveness, and tenderness to others. I seek the calm that comes from trusting in your hope and your healing presence. I trust that your servant St. Jude walks with me in all the blessings and challenges of my life, and intercedes on behalf of my petitions. St. Jude, fill my heart with hope. Through your intercession, St. Jude, please help me to always be open to the calming presence of God. Help me to remember how important my forgiveness toward others can be, for their peace as well as for mine. I will continue to pray for peace between nations. But I also want to contribute to building peace in the corners of the world that I live in, and with the people I meet . . . whether I know them well or not. May God grant my family peace. 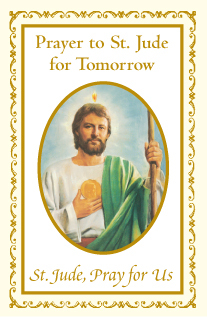 And may He grant me peace and strength as I continue to work to follow Jesus’ teachings. Thank you, St. Jude, for being a source of deep hope and for bringing my petitions to God. St. Jude, may your path of hope be mine in the days ahead. I promise in faith to share your hope with others, to forgive as I am forgiven by my Father in heaven, and to show caring and kindness at every opportunity. 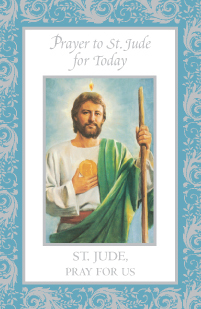 Guide me, St. Jude, so that I begin each new day with gratitude, truth, and hope in my heart. Challenge me, St. Jude, to end each day reflecting on my actions and motivations so that I grow in faith, love, and hope. St. Jude, you are the bearer of abiding hope. I place myself in your care as I bear the cross of cancer. I trust that you intercede constantly for me, giving me courage when I am afraid, strength when I grow weary, hope for my most difficult challenges. Most faithful patron, may you remind me always of the love and healing God offers to each of His children.